Building the deluxe upgraded version of the live axle go kart can be fun for both you and your kids. 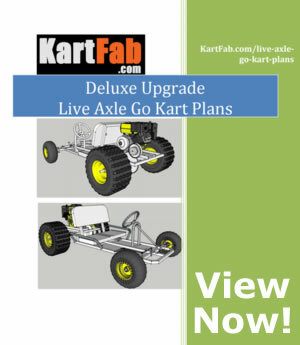 Download the PDF plan bundle at KartFab.com and get exclusive access to the build support page. This deluxe live axle go kart kit provides you with the parts you need when building a live axle off road go kart from scratch. Upgraded knobby tires, torque converter, and brakes will give you the best speed and performance on or off road. build customization with two plan versions included to choose between brakes, clutch, wheel size, and engine. - Currently out of stock on seat slides, seat can be mounted directly to frame ( just not adjustable). We will send seat slides when they arrive, expected in 1st week of May. We have completed building the go kart using this kit and it works great. We didn't have any real problems and everything went together very well. This kit saved us a lot of time. These guys obviously know what it takes to build a go kart and they have put together an excellent package. I wanted to start this project on a tight schedule so I called to ask about shipping times. I was promised a delivery by Thursday, which I thought was impossible but i figured that meant I would get it a few days later. Instead, I got the delivery a day EARLY, on Wednesday! Everything was in the package and packed very well. At one point I had a question so I sent them a question using their online form. I was hoping for an answer in a couple of days ... my question was answered in a few minutes! Big time and money saver. My son and I decided to build a go cart and after tons of research decided to go with the plans from kartfab.com. They worked with Gopowersports to put together this kit and I am glad they did. Not only is it a big money saver over purchasing the parts individually, it is a huge time saver as well. They shipped the order really fast. I had a few a few minor issues with some of the parts and both Kartfab and Gopowersports bent over backwards to help me out.